Situated in the highlands of northern Ethiopia, Aksum symbolizes the wealth and importance of the civilization of the ancient Aksumite kingdom, which lasted from the 1st to the 8th centuries AD. The kingdom was at the crossroads of the three continents: Africa, Arabia, and the Greco-Roman World, and was the most powerful state between the Eastern Roman Empire and Persia. In command of the ivory trade with Sudan, its fleets controlled the Red Sea trade through the port of Adulis and the inland routes of northeastern Africa. 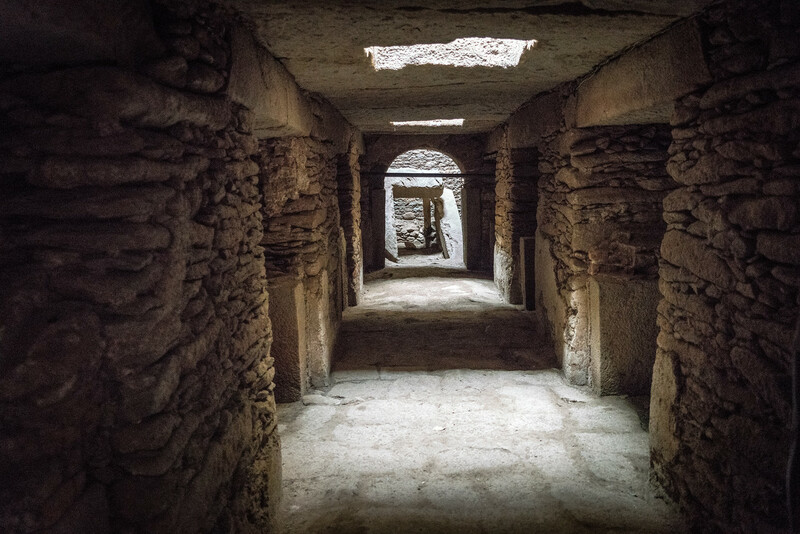 The ruins of the ancient Aksumite Civilization covered a wide area in the Tigray Plateau. The most impressive monuments are the monolithic obelisks, royal tombs and the palace ruins dating to the 6th and 7th centuries AD. Several stelae survive in the town of Aksum dating between the 3rd and 4th centuries AD. The largest standing obelisk rises to a height of over 23 meters and is exquisitely carved to represent a nine-story building of the Aksumites. It stands at the entrance of the main stelae area. The largest obelisk of some 33 meters long lies where it fell, perhaps during the process of erection. It is possibly the largest monolithic stele that ancient human beings ever attempted to erect. A series of inscriptions on stone tablets have proved to be of immense importance to historians of the ancient world. Some of them include trilingual text in Greek, Sabaean and Ge’ez (Classical Ethiopian), inscribed by King Ezana in the 4th century AD. The introduction of Christianity in the 4th century AD resulted in the building of churches, such as Saint Mary of Zion, rebuilt in the Gondarian period, in the 17th century AD, which is believed to hold the Ark of the Covenant. It was the seat of the Axumite Empire, which reached its peak in the first millennium. The Axumite Civilization was one of the largest and most important in East Africa. The current standing Stella and other ruins as some of the largest and most extensive in all Sub-Saharan Africa. It is the location where Ethiopian Orthodox believe the Ark of the Covenant was taken and now resides, making it the most important pilgrimage destination in Ethiopia. Most of the historical and religious attractions are within an easy walking distance of each other. In fact, the main collection of stele is right across the street from the St Mary’s Cathedral. It is an affordable destination and it is worthwhile to hire a guide at least for a day to provide some context to what you are seeing. Aksum is a cultural UNESCO World Heritage Site in Ethiopia. It was inscribed into the UNESCO list in 1980. This city is located on the northern portion of Ethiopia, which was recognized by UNESCO as it is known as one of the oldest inhabited places in Africa. 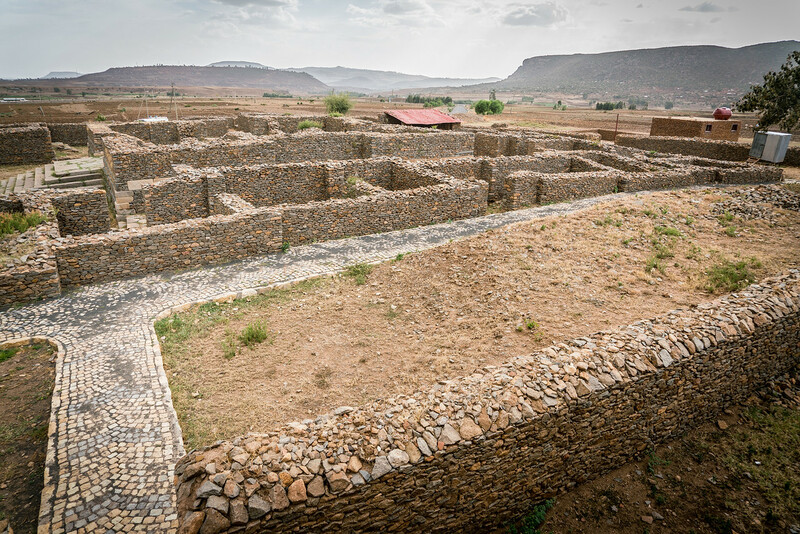 There are several ruins in Aksum that show evidence to the fact why this city is considered as the center of ancient Ethiopia, particularly during the time when the Kingdom of Aksum is among the most powerful during the time of Eastern Roman Empire and Persian rule. Aksum is therefore filled with massive ruins that can be dated to the 1st and 13th century AD. The archaeological sites within this city are therefore a testament to its historic value. Aksum is located among the highlands in Northern Ethiopia. It was a symbol of wealth and power during the height of the ancient Kingdom of Aksum. This rule of the kingdom lasted from the 1st until the 8th century AD. One of the secrets to the success of this kingdom is in the fact that it is geographically located between the crossroads of three continents: Africa, Greco-Roman, and Arabia. The Kingdom of Aksum was so powerful that it had its own written language established – Ge’ez. At the same time, the kingdom also developed a distinctive architectural style that is noted for its ability to incorporate giant obelisks into its design. The oldest obelisk in existence was built around 5000 to 2000 BCE. The height of the kingdom was in the 4th century when it was ruled by King Ezana. 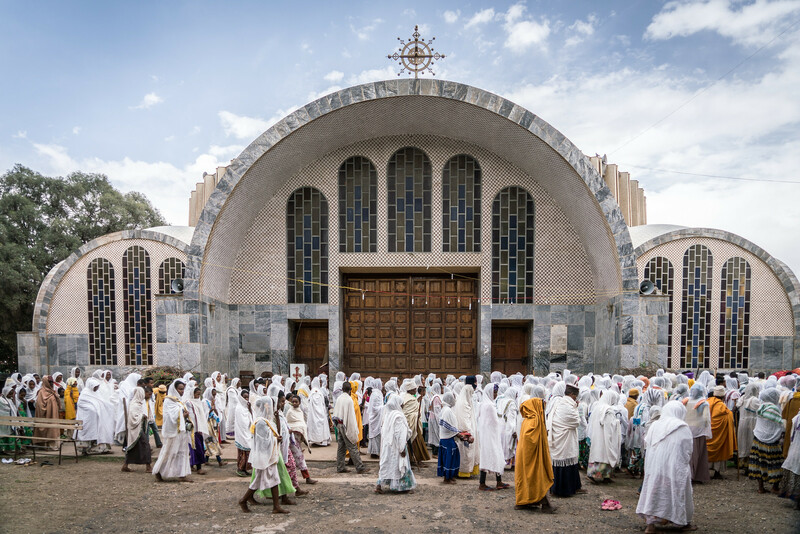 According to the Ethiopian Orthodox Church, the Church of Our Lady Mary of Zion in Aksum houses the Covenant’s Biblical Ark. This is also believed to be where the Tablets of Law is hidden. The Tablets of Law is biblically important because the scriptures have stated that this is where the Ten Commandments were inscribed. There are even claims made by the Ethiopian Church that the Ark still exists in Aksum. The Obelisk of Aksum is a 24-meter tall obelisk that is 1,700 years old. This obelisk was broken into five parts in 1937. Each of these parts is now lying on the ground. 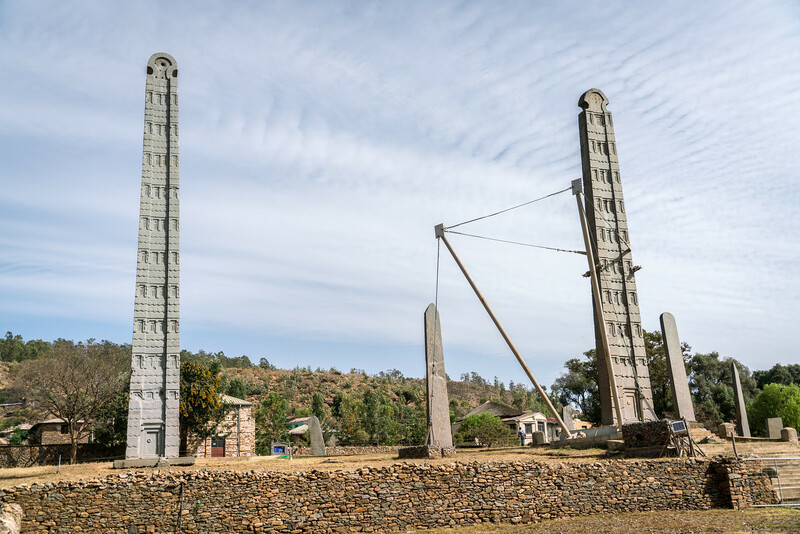 Many consider this obelisk as one of the best examples of engineering during the height of the Kingdom of Aksum. As of 2008, the obelisk has been re-installed in Ethiopia with the help of UNESCO. 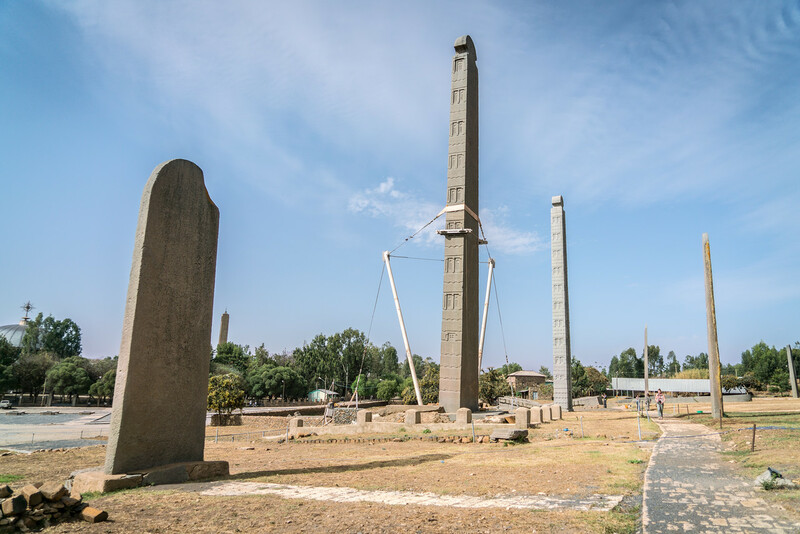 The obelisk is not the only culturally and historically significant monument in Aksum. One of these monuments are the stelae. There are several stelae that have survived in Aksum from the 3rd and 4th centuries AD. Aside from the stelae, you will also find a series of inscriptions on stone tablets in Aksum. The ancient historians believe that these stone tablets are of immense importance to the study of ancient history, especially within the kingdom of Aksum. These stone tablets depict inscriptions from various trilingual text including Classical Ethiopian, Sabaean, and Greek, to name a few. On top of the obelisks, the royal tombs and churches also form a major development of the cultural landscape in the Kingdom of Aksum. These, alongside the other aforementioned monuments, exemplify the power and wealth of the kingdom. View the complete list of UNESCO World Heritage Sites in Ethiopia. I’m looking into visiting Lalibela as a short trip from Addis Ababa by return flight. Aksum seems to be further North … how did you get to Aksum? Is there an airport? Cheers. Yes there is an airport. It probably is too far to do as a day trip. I’d recommend staying there 1 or 2 nights. Ethiopia is one of the great, safe and exotic destinations Americans have still to explore. Our group does trips there and just came back from N and S. Ethiopia with endless photos and videos that seem to come from another age. 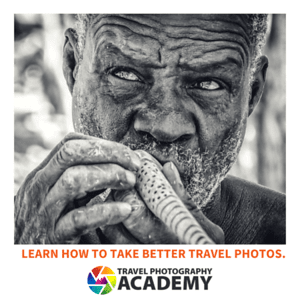 We strongly recommend tourists look into Ethiopia as a bucket list spot. Unfortunately we chose the Omo River and places farther afield so we missed Axum.